Now you too can have your very own gan—I mean temporary hand tattoo. Is Dr O Miguel? Does that mean Miguel is still alive? Find out next time! You can now get temporary tattoos for only 1000 Yen. U20 is gonna be in real life too. Also more stickers to buy. Who doesn’t love stickers? If you own a racing car you can now buy stickers for your card. You can now buy racing car fan trickots and add your favorite vanguard units. We know you want to! It comes in the unrealistic size expectations of small, medium and large. Your favorite characters as vanilla strides. Episode 28 will feature these guys, as shown in the preview. [AUTO](VC)(Generation-Break 8):When this unit attacks a vanguard, retire all opponents rear-guards, and during this turn, all your rear-guards get [Power] +10000. If 3 ore more were retired, this unit gets [Power] +10000/[Critical] +1 until end of turn. 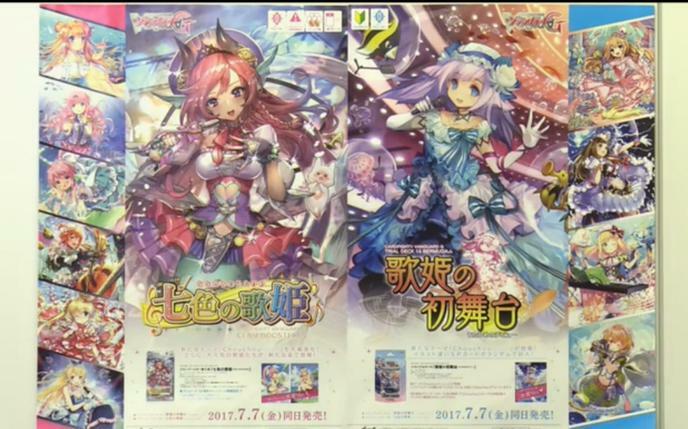 Finally the Trial Deck and Clan Booster for Bermuda Triangle have been revealed: Divas of the Rainbow (Clan Booster) and Stage Debut of Divas (Trial Deck). The ChouChou is not a train but the artist team. Has main Grade 3, G Units and G Guardian. The usual Trial Deck stuff. You can pull the main grade 3 in the Trial Deck as SP! Pacifica, Lauris, Riviere, Raindear, Coral, Duo and more! This time with Swimsuit-SPs. Riviere never returned from that summer vacation it seems. And the poster that will reveal the details for the set. That’s all for this week. Thanks to Sangaera from Pojo for the translations!